Often magical moments aren't part of a touring plan. Here a Cast Member created one such magical moment on Main Street, USA in the Magic Kingdom. Using only a few simple tools like a broom and a bucket of water he brought smiles to everyone around. Some Guests kept walking without noticing the artwork below their feet. Others stumbled over it laughing. Sadly the water art evaporated in a matter of minutes in the FL heat but the magical memories that sidewalk artist created will always remain. 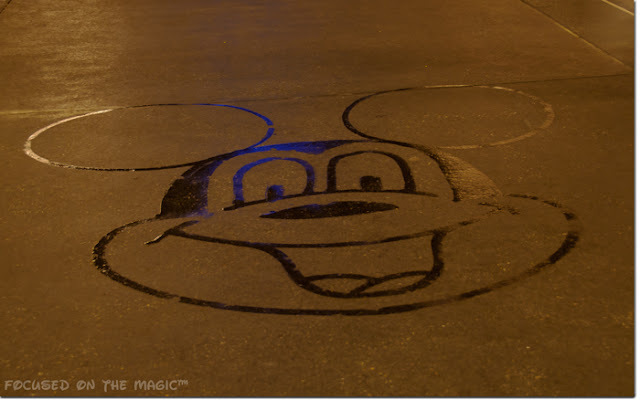 Have you seen the water artists in the parks? Did it make you smile? Yes! We actually saw a CM making a Mickey and Donald at ESPN's Wide World of Sports when we were there in March for a Braves game! Casey, I know aren't they fun? LOVE the water art...so so cool! That is so awesome. I've never seen that before. Now I have something else new to watch for on my next trip. Fantastic! This is the kind of thing that makes each trip unique!! Thanks for sharing.